10 Clothes hangers. This hanger have special hook. It can avoid blow away by wind. Made of Stainless Steel, durable and compact. Note: The real color of the item may be slightly different from the pictures shown on website caused by many factors such as brightness of your monitor and light brightness. (2) Strong spring, clamping firmly, clothes are not easy to fall off. 3) Adjustable clamp position, fit various pants width. Color: Silver & Black. 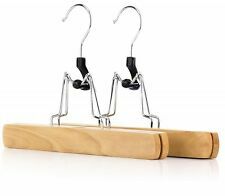 1 x Trouser Pants Ties Scarf Shawl Rack Hanger. Practical and durable for daily use, also doubles up as a clothes drying rack. Convenient for wardrobe selection and viewing of your pants. Color: Silver&Black. 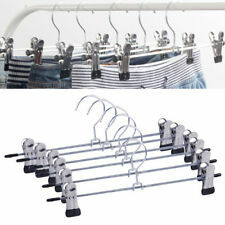 2, Each hanger has four layers, effectively saving wardrobe space. Material: stainless steel. 1, Made of stainless steel, it is wear-resistant and durable. Gross weight: 250g/piece. Product size: about 32.5 36cm / 12.80 14.17in. Winter Children Girl Kids Baby Warm Wool Hats Beret Artist Beanie Hat Ski Cap 8C. Cozy Soft Strawberry Pet Dog Cat Bed House Kennel Doggy Cushion Basket Beds 8C. Wooden Sewing Organizer Needle Box Toothpick Storage Holder Safety Case 8C. Great decorative hangers, but also practical. Adult ladies pearl beaded hangers. Exquisite design and elegant appearance. Material:aux pearl. They take up less room than wooden coat hangers so are great if you are looking to create more space or fit more into your wardrobe. We will always do our best to resolve any issues. Genuine & Authentic. You can swing it close to the wall to save space when you don`t use it. It can swing 180 degrees to the left and right. 1pc Hanging Rack. Material:Stainless Steel. Due to the light and screen difference, the item's color may be slightly different from the pictures. For hanging skirts or trousers. The ultra slim. 10x Black Coat Hangers. of the clothing, the product also features 2 small hooks suitable. The black plastic is very durable and the gentle curves preserve the shape.